The Mars rover Curiosity was launched from Cape Canaveral on November 26, 2011, at 15:02 UT aboard the Mars Science Laboratory (MSL) spacecraft and successfully landed on Aeolis Palus in Gale Crater on Mars on August 6, 2012, 05:17 UT. 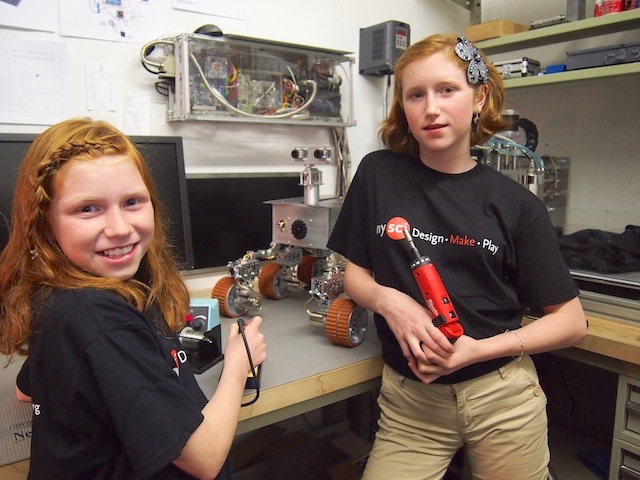 Venture Beat reports that two sisters, Camille and Genevieve Beatty, aged 11 and 13, have built a Mars rover in a workshop in their family’s garage. 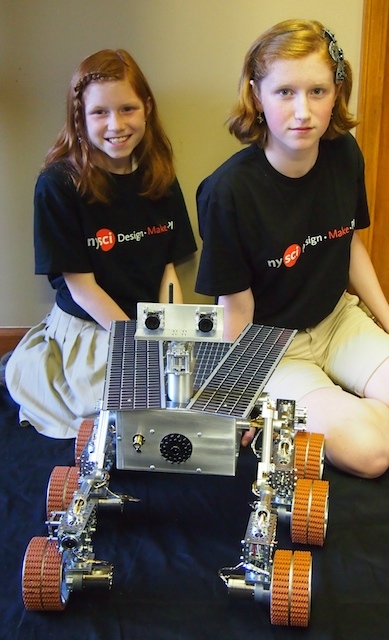 They have been invited to the New York Hall of Science to show off their rover as part of a special exhibit on astronomy. The rover will roam around a mini-Martian landscape and analyze rocks with hidden heat lamps embedded inside. NASA officials and crew members aboard the International Space Station will observe the first anniversary of the Curiosity rover’s landing on Mars at a public event in Washington from 16:00-17:30 UT (12-1:30 p.m. EDT) Tuesday, August 6. The event will be broadcast on NASA Television and streamed live on the agency’s website. Media and the public are welcome to attend to hear highlights from the Mars Science Laboratory’s first year of investigations, learn about upcoming NASA robotic missions to the red planet, and speak with astronauts conducting experiments in space that will enable human exploration of Mars in the 2030s. Those interested in attending should plan to arrive at NASA Headquarters, 300 E St. SW, by 15:30 UT (11:30 a.m. EST) Seating is limited. The Mars Science Laboratory mission successfully placed the one-ton Curiosity rover on the surface of Mars on Aug. 6, 2012, UT, about 1 mile from the center of its 12-mile-long target area. 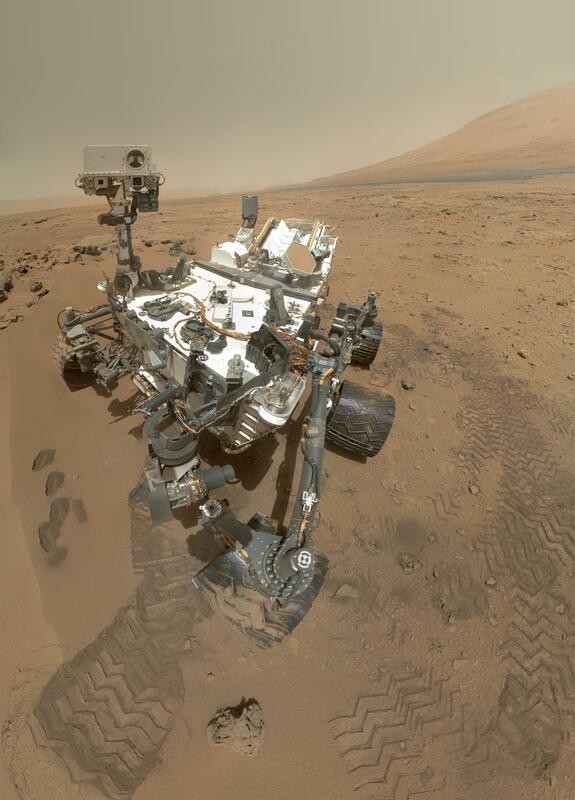 Within the first eight months of a planned 23-months primary mission, Curiosity met its major science objective of finding evidence of a past environment well-suited to support microbial life. With much more science to come, Curiosity’s wheels continue to blaze a trail for human footprints on Mars. To follow the conversation online about Curiosity’s first year on Mars, use hashtag #1YearOnMars or follow @NASA and @MarsCuriosity on Twitter.